Duncan Hubbard is a leading international real estate finance lawyer with more than 20 years of experience in the sector. His clients include global funds, financial institutions and investors. 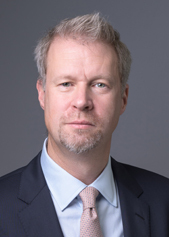 Duncan has acted on some of the largest UK and international property finance transactions, from single assets, such as The Gherkin in London, to cross-jurisdictional funds with investment and development portfolios across the world, ranging from logistics in Korea to health care in London. He also advises financial institutions on regulatory compliance issues concerning CRD4 and is a special advisor to the Association of German Pfandbrief Banks (VDP). Duncan obtained a Bachelor of Divinity from Kings College, London, before converting to law through Exeter University. He is admitted to practice as a solicitor in England & Wales. Project Bedrock in a €1 billion portfolio financing across eight jurisdictions in Europe, acting for the sponsors. *Several of the above representations were handled by Duncan prior to joining Cadwalader.